If you have all of the music you need for your Phoenix area wedding, party or event and you do not require professional DJ services, renting DJ audio and lighting equipment may be your solution. DJ Billy James offers affordable, user-friendly DJ rental equipment and can customize a rental package to meet your needs. You provide your own music on a smartphone or laptop and someone to take charge of setting up and operating the equipment. If you are an out-of-town DJ, musician or vocalist coming to Phoenix to perform at a friend's wedding or party, DJ Billy James offers sound equipment rentals tailored to your needs. Need a microphone for your presentation, grand opening or company event? DJ Billy James offers a variety of sound system rental packages to accomodate any size audience. Delivery and set-up is available. Past corporate clients include The Home Depot, Lowes, Walmart, Bank of America, Wells Fargo, OfficeMax, ProCamps Worldwide, Mayo Clinic and ASU. Features a single 1,300 watt powered speaker with more than enough thump to handle all styles of music for smaller parties and events up to 50 guests. Just connect your smartphone, iPod or laptop by aux cable or Bluetooth and you’re ready to party! Select the speaker size that matches your playlist. The 10” speaker works great for pop, jazz and country music played a moderate volume. The 12” speaker is a good choice for dance music. For even more dance music thump, go with the 15" speaker. You can even add a microphone or two if you need one with the speaker's built-in 3 channel mixer. Perfect for backyard and small venue gatherings where you want great sound, but don’t need super heavy thump for your dance music. Two 10” speakers, each with 1100 watts of power! Just connect your music by aux cable or Bluetooth and you’re ready to party. With the speaker’s built-in 3 channel mixer, you can easily add a microphone or two if you need one, and daisy-chain the two speakers together. A great choice for events up to 75 people. Includes two 1,100 watt powered speakers, a wired microphone, and a 4 channel mixer. The 10” speakers deliver great dance music for events up to 100 guests. For larger events and more thump, go with the 12” speakers. Just connect your music source and let the party begin! This package is designed to accomodate the needs of musicians and vocalists. The Presentation Package is a compact, self-contained sound system with inputs for microphones and music. Perfect when a simple, easy-to-use sound system is needed for a presentation with the option for background music. The 200 watt column-style speaker weighs only 25 lbs., sets up in minutes and has Bluetooth connectivity. The basic package ($99) includes one speaker with a built-in 3 channel mixer and is best suited for audiences up to 50 people in a meeting or conference room setting. The deluxe package ($149) includes two speakers and will accommodate audiences up to 150. Both packages include a wired microphone with the option to upgrade to a wireless microphone. A battery powered speaker is the solution when you need a sound system but electrical power is not available. With inputs for your iPod, laptop, smartphone or acoustic instrument, a built-in mixer, and Bluetooth capability, a battery powered speaker can provide music for your wedding ceremony in the park, tailgate party, picnic or any outdoor event. A wired microphone, if needed, can be included at no extra charge. Wireless microphones are not available with battery powered speakers. A retractable luggage-style handle and wheels provide easy transport. The Basic Package features an 8” speaker with 40 watts of power and is the perfect choice for an outdoor wedding ceremony or any event where a microphone and background music is needed. The Pro Package features a 10” speaker with 100 watts of power and is suited for parties and events where music will be played at a higher volume. Both speakers will provide 6 to 8 hours of high quality sound when the built-in lithium battery is fully charged. The perfect sound system solution for your wedding ceremony where electrical power is available. This compact, 200 watt column speaker features a built-in three channel mixer with inputs for your music and the two included microphones. There’s even a Bluetooth option to connect your music source. You get a wireless hand-held or clip-on mic (your choice) for your officiant and a wired floor stand mic for your presenters or vocalist. Also included is an accessory floor stand for the wireless mic receiver and your music source. For audiences up to 75 people. For larger audiences, you can add a second speaker. The Kinta FX is three light effects in one unit. Flood your dance floor with multi-colored light beams, dynamic red and green lasers and white strobe lights all moving to the beat of your music. The Aggressor Hex is a sound activated LED light fixture designed to fill large areas with hundreds of bright, dancing beams in six colors: red, green, blue, cyan, amber and white. This fixture does not contain lasers or strobes. Create the ultimate “wow” factor for your wedding reception, party or special event with LED uplighting. Transform your venue from drab to dazzling in minutes with wireless, battery powered LED up lights. No power cords, no cables. Set up and take down in minutes. Choose from a variety of colors to complement your theme. Simply place the battery powered fixtures on the floor throughout the room to illuminate one or more walls for dramatic effect. 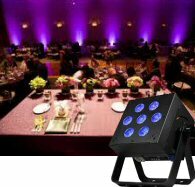 All lights are controlled by a wireless, pre-programmed DMX controller included with each rental package. 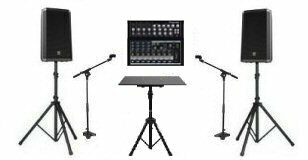 Rental Policy: Prices for DJ Equipment Rental Packages are based on renter pick up and return of equipment at our NE Phoenix location. Equipment can be picked up the day before the event and returned the day after for the 1 day rental fee. All rentals require a signed rental agreement, payment with a major credit card (no cash) at time of rental pickup. A $50 deposit (credit card only) is required to reserve equipment and is applied to total rental cost. If you cancel at least 48 hours prior to your event date, your deposit will be refunded less a $20 processing fee. If you cancel less than 48 hours prior to your event date, your deposit is not refundable. If you must reschedule your event date, your deposit will be applied to the new date.